“Americans – living in a huge country which has never really been invaded, and as the sole superpower – are famous for being out-of-touch with how the rest of the world thinks. 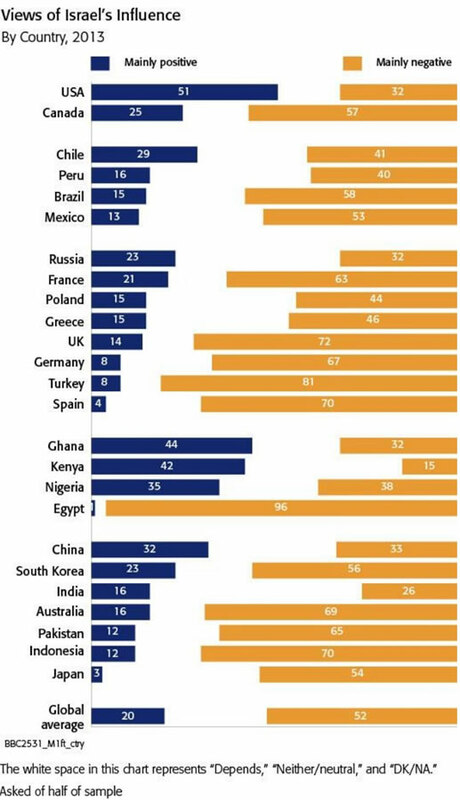 So my fellow Americans will probably be surprised to learn that the U.S. is more or less the only country in the world which has a favorable view of Israel. 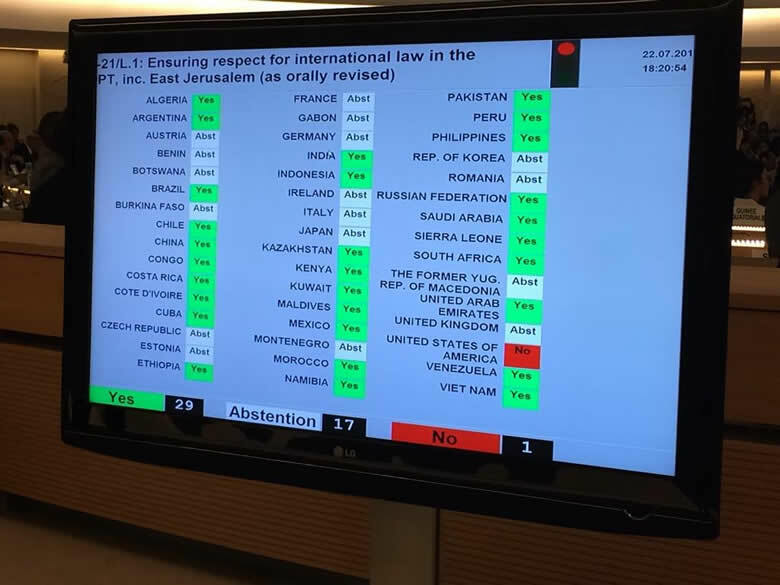 Another measure of world opinion on Israel is that the United Nations has condemned Israel’s violence towards its neighbors again and again. Israel holds the record for ignoring United Nations Security Council resolutions, according to a study by San Francisco University political science professor Steven Zunes. Israel leads the list. Since 1968, Israel has violated 32 resolutions that included condemnation or criticism of the governments’ policies and actions. Zunes specifically avoided counting resolutions that are vague or unclear so that governments could claim different interpretations to the meaning of the resolutions. Thus, the famous UN Security Council resolutions 242 and 338 are not included in his study. He also did not count resolutions that only included condemnations. Instead, he focused on those that included specific calls for changes in the subject governments’ policies. The resolutions Israel violated were either about its annexation of East Jerusalem or settlements in the territories. Israel also ignored UN Security Council resolutions that called for Israel to cease using harsh measures against the Palestinian population and to cease expelling Palestinians. Pulitzer prize winning journalist Chris Hedges points out that Israel has broken nearly a hundred UN Security Council resolutions regarding Gaza alone. Resolution 450: (June 14, 1979) ” … ‘calls’ on Israel to stop attacking Lebanon”. Resolution 501: (February 25, 1982) ” … ‘calls’ on Israel to stop attacks against Lebanon and withdraw its troops”. Resolution 517: (August 4, 1982) ” … ‘censures’ Israel for failing to obey UN resolutions and demands that Israel withdraw its forces from Lebanon”. Resolution 520: (September 17, 1982) ” … ‘condemns’ Israel’s attack into West Beirut”. 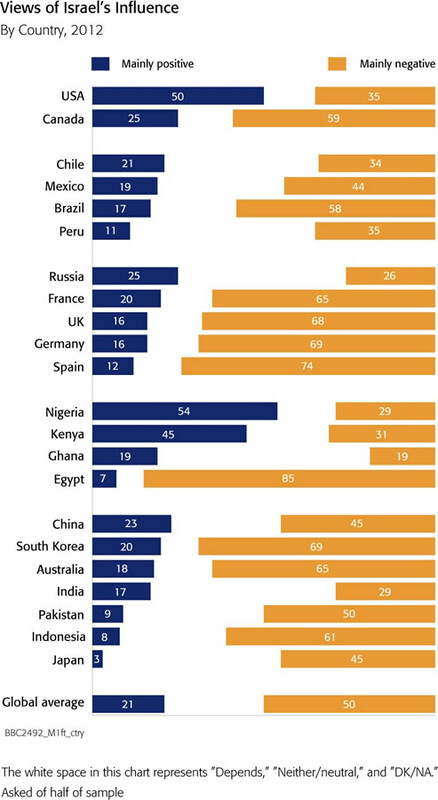 Even with the United States, there are only certain groups which support Israel. Do You Suffer from Learned Helplessness ?